In 2013, the International Council of Management Consulting Institutes (ICMCI www.cmc-global.org ) completed a successful pilot on a proposed CMC-Firm initiative, the objective of which was to create a global directory of national Accredited Consulting Practices (ACPs), all large or medium sized firms who play a key role in the consulting industry and who also manage or are developing international connections in a market where ICMCI is a main player. 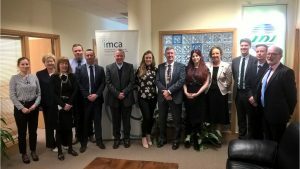 IMCA visited IDI head office recently to meet with the IDI Team and to present the firm with the CMC-Firm parchment. 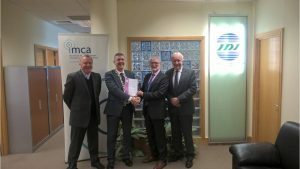 Pictured above are members of the IDI Team, and the presentation group (L to R): Ronan Deignan, IDI Managing Director; Martin Markey, IMCA President; Ted Bowe, IDI Executive Director; and Denis McCarthy, IMCA CEO.